Continuing the milestone initiative commenced in January 2018 to eradicate a vital national menace, the sustainable waste management solutions provider INSEE Ecocycle Lanka (Private) Limited, popularly known as INSEE Ecocycle, once again joined hands with the Sri Lanka Police (SLP), Police Narcotics Bureau (PNB) and National Dangerous Drugs Control Board (NDDCB), Government Analytical Department (GAD) and President Task force for drugs Prevention to responsibly dispose confiscated Cocaine Hydrochloride through Cement Kiln co-processing for the second-time in Sri Lanka. In January 2018, the company disposed of 928kgs of confiscated Cocaine using the same technology taking the first forward step to resolve the problem. The cocaine material was confiscated by Sri Lanka Police Narcotics Bureau, followed by the verification of the narcotic material under the guidance of Government Analyst Department (GAD), NDDCB and Attorney General’s Department. INSEE Ecocycle has carried out the technical evaluation with the support of PNB and NDDCB on feeding mechanism and pre-processing activities for safe disposal of the dangerous drug whilst minimizing the social and environmental impact. Deputy Inspector General of Sri Lanka Police Narcotics Bureau, Sajeewa Medawatte, “INSEE Ecocycle successfully carried out the 1st ever cocaine disposal in a scientific manner with proven cement kiln co-processing in 2018. 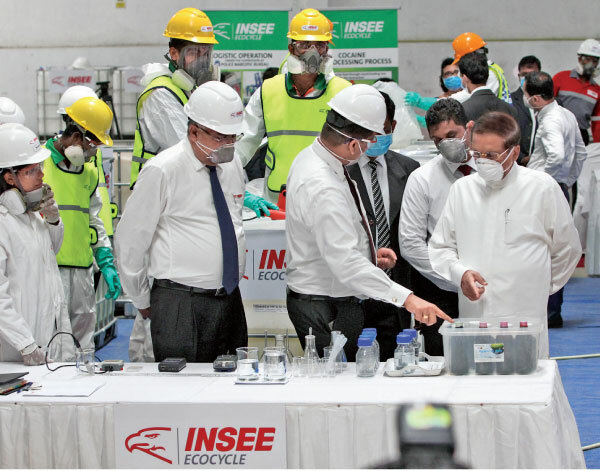 We have experienced their technical knowhow, systems compliance and state-of-the-art infrastructure and are happy to join hands with INSEE Ecocycle for the safe disposal of confiscated cocaine” he said. There are several ways of waste feeding mechanisms available at the Cement Kiln co-processing facility. The liquefied material will be transported for final disposal to Puttalam Cement Plant where the second phase of the disposal will take place on the 1st April 2019.